The Smart I/O™ EC160XP is a fully programmable controller allowing a complete sequence of operation customization for today’s ever-changing control strategies that are required to meet continued energy efficiency requirements. The reliable cost effective I/O is continuously monitored and precisely controlled by a microprocessor for exceptional performance. To eliminate memory constraints caused by today’s complex applications an additional 8K of external SRAM has been added to the existing memory architecture of the EC160XP. As an option, a precision airflow sensor can be added that provides reliable and accurate measurements allowing superior performance. Communication for monitoring, control and diagnostics is achieved utilizing a LonTalk® TP/FT-10 network with a simple twisted-pair, non-polarized cable. The controller features serial communication to a Smart Controls SI-20 remote room sensor interface. The SI-20 features a fully programmable display for unprecedented custom application functionality. 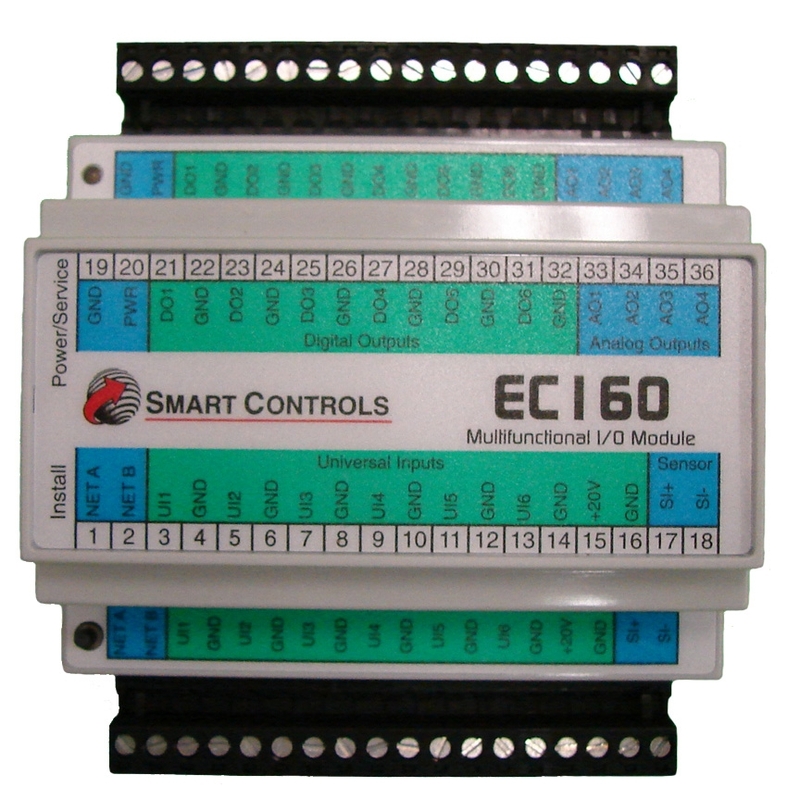 The EC160XP controller is protected from reverse power supply input wiring, over-voltages, transients, and other common events that can damage unprotected inputs and outputs. User defined algorithms and functions can be programmed using VisualControl™, NodeBuilder, LonBuilder or other third party LONWORKS programming tools. The application program can be downloaded over the LonTalk network and is stored in nonvolatile memory allowing the application to be retained even after loss of power. The versatile I/O allows numerous applications to be development and implemented with the EC160. The enclosure snaps securely onto a 35mm DIN-rail for quick and easy mounting. A spring-loaded locking clip allows for quick and easy removal. The wide operating temperature range, -20 to 70 °C, makes the EC160 well suited for many demanding applications.